Thirumeyyam/Sathyakshetram/Venuvanam /Adi Rangam is one of the 108 Divya Desams of Lord Vishnu located in Madurai, Tamil Nadu. This is one of the oldest temples of Lord Vishnu built by King Mahendra Pallava with a close resemblance to Rock temple of Mamallapuram. This temple is positioned at a tranquil atmosphere of Vaishnavi Durgai hills. Located on the Pudukottai-Karaikudi/Tirupattur highway, Thirumeyyam is also called Sathiya Giri and Sathiya Kshetram and is surrounded by a huge fort like structure. This temple dates back to the 7th Century AD. The Lord here is bigger than Lord Ranganatha of Srirangam. On the wall just above the deity one finds images of Brahmma and several Devas. Adiseshan is believed to be protecting this place. The story goes that when the Asuras tried to kidnap the Lord, Adiseshan let open poisonous air to kill the asuras. As a reference to this incident, one can see Adiseshan being depicted in the same form here at this temple - letting out poisonous air - a unique feature at this Divya Desam. It is said that Lord Vishnu’s guard (at this fort) incurred the wrath of Sage Durvasa, who cursed him to turn into a snake and was finally relieved of his curse here at ThiruMeyyam. There is no end for Sathyam (Truth) and it never sleeps and doesnt forget anything. It calculates the good and the evil actions performed by the people and according to that, all fo the souls are reached to proper destiny. If we do good and our actions lead to good thought and action, we will reach the thiruvadi (feet) of Sriman Narayanan and if we think of bad things and as a result of it, if we perform bad and evil actions, we will be going to the hell. To explain this, the perumal is found in Bogha sayanam in Kidantha kolam without sleeping and calculating the good / bad actions of all Aathmaas. All the things that live in this mighty Earth are governed and watched by the Emperumaan and to explain this, the perumal is found in Nindra Kolam with the name "Sathya Moorthy" (or) "Sathya giri Nathan". In tamil, the truth is referred with the word "Mei" and the Utsavar of this sthalam is "Meyyan" (or) "Meyyappan". The perumal is found in Anantha Sayanam and is found inside the sannadhi which is surrounded by very good sculptural and artistic work as seen in Mahabalipuram. In older days, when Asurars where dominating the world and the Adharmam (evil) was spread along the entire world. Because of this, there was not much of Yagams and poojas were done and all the Rishis, and Devars were very much frightened about this. They could not protect the Asuras, since they get enormous powers with them. They all surrendered towards "Dharma Devathi", the goddess of Dharman and pleased her that she must help them to get out this danger. Dharma devathai replied them that she will help them out, thereby changed herself into a deer and came to this Sathya Kshetram which is also called as "Venu Vanam", since this sthalam is fully covered by Bamboo trees. The perumal came infront of Dharma Devathai and promised her that he would stay in the sthalam as "Sathya giri Nathan" and helps all the peoples and including the Rishis and Devas from Adharmam. Once, Athri Muni and his wife Anusuya lived, who are said to be the strong believer of the Emperumaan. They were so famous for their bhakti and tapas towards the perumal and they started for doing tapas against all the Mum - Moorthies (i.e.) Sriman Naryanan, Brahma devan and Lord Shiva and their wish was as one of the hamsam of these Thriumurthies they should have their children born. All the murthies agreed and as a result as the hamsam of Sri Vishnu a child was born who is called as "Dattatreyar", as the hamsam of Lord Shiva the Moon God was born. All these 3 children's were taught with proper Vedas and mantras and were sent to do tapas by their fther, Athiri rishi. First, Durvasa Rishi went to Kailasa malai and Dattatreyar went to the foot of the Himalayas to do the tapas and the Moon god came to this Sathya giri kshetram to do the tapas against Sriman Narayanan. The perumal gave his seva as satisfied by on his tapas and asked his wish. The moon god asked that since he stays in Surya Mandalam his Vaasam (stay) should be also in Chandra Mandalam (Moons Place). For this, the perumal accepted and stayed in Chandra Mandalam also. We can see the well stretched and huge Raja Gopuram, which is found at the entrance of the temple. This sthalam is also called as "Aadhi Ragam" and the perumal is older and big than that of the perumal found in Sri Rangam. After entering through the Raja Gopuram, we can find a big Mandapam where lots of stone carved pillars are found with beautiful paintings. Separate sannadhi for Sri Kannan, Sri Aandal, Chakrathalwar and Narasimhar are found. After crossing this Mandapam another big mandapam by named "Maha Mandapam" is found in which the Garudan facing along the Moolaver Sannadhi is found. Moolavar Sathya giri nathan in Nindra thriukkolam and next to this sannadhis, separate sannadhi for Uyya Vandha Naachiyaar is found. On the western side inside the mountain, as Bogha Sayana Moorthy in Anantha Sayanam, the perumal in another thirukkolam is giving his seva and this perumal is big in structure then Sri Rangam Ranganathar. Having Aadhiseshan as the bed, the perumal gives his Kidantha Kola seva with two Thirukkaram (hands) as same as the Ranganathar found in Sri Rangam. It is said that some Madhu Kaidapars (Amsam) came from the Ears of Sriman Naryanan of this sthalam and they tried to grab bhoomi piratti along with them. But, Aadhiseshan protested and fought with them and killed all of them by his poison. But, it was little bit worried because without getting the permission from the perumal, he did this. It stayed infront of the perumal convinced him ans as a result of this, the perumal's one hand is found towards Aadhiseshan as conveniencing him and another hand is found on his chest there by protecting the piratti. Around this perumal, Chitraguptan, Maarkandeya Maharishi, Brahma devan and Garudan are found. Chitraguptan who assist along with Yamen, the king of Naragham (the hell) and the Maarkandeya maharishi who has got the "Sirangeevi" throne are found around the perumal to show the couts of people along with their good and evil actions performed by them. On the thiruvadi (feet) of the perumal, Bhoomi piratti and Madhu Kaidapars are found. This temple is almost the same as that of the temple in Mahabalipuram. We can find lots of stone carved Sculptures and paintings and the perumal is found inside the mountain and it serves as the umbrella for him. 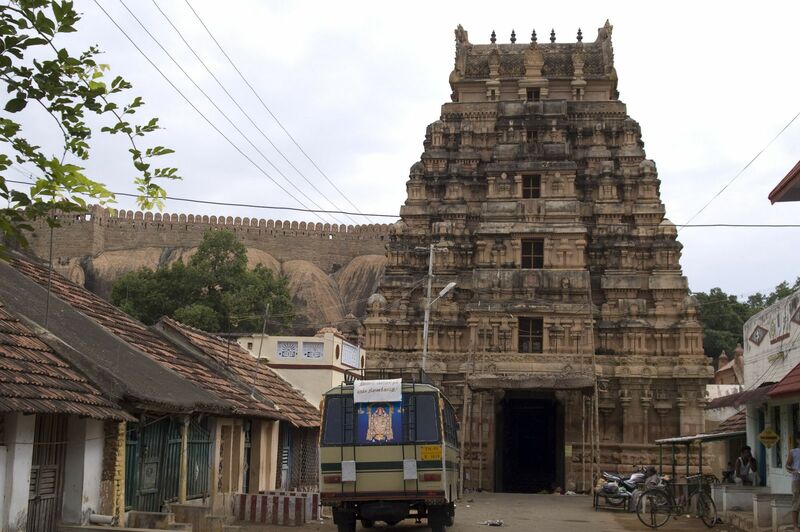 Another temple by named "Keeyai Kovil" is found where a temple for Lord Shiva is found. The name of him is "Sathya gireeswarar". It is said that Mahendra pallavan had constructed this temple for both Lord Vishnu and Lord Shivan without having any racism between Saivism and Vaishnavism. This "Thirumeyyam" is surrounded by lots of mountains and a special hill by named "Vaishnavi Durgai" hill is also found which is famous for its beauty and the Vaishnavi Durgai found inside the hill. It is believed that holy dip on Sathya Theertham during the days of Pournami in the Tamil month Vaikasi is highly meritorious and eradicates sins committed. All the sacred rivers unite on this holy pond on the above auspicious day and provide abundance of merits to whoever takes holy dip in this water. On the Chitra Pournami day, Sathiya Moorthy Perumal is taken out on a 40 mile procession to Kadaya Kudi. 18kms South of Pudukottai, 25 kms North of Karaikudi. One can take Pudukottai-Karikudi or Pudukottai-Tirupattur bus to reach here.